The now iconic "Violin Bass" was introduced in 1956, and was conceived and designed by Walter Hofner. The bass has undergone many changes since it's introduction over 60 years ago, but most of them have been hardware and electronics related. The Violin shaped body has remained mostly unchanged since it's inception! One might conclude that the impetus for the body design was a desire to mimic the "look" of an upright bass, and presumably this would appeal to double bass players who might want a more portable bass instrument, and I'd venture to say it was a successful design strategy as the bass is still in production today and going strongly. I am sure this is also due in part to its usage by some British kids and their pop band, who gained fame in the 1960's! I have examined, tested, serviced and set-up this instrument and found it to be factory-correct and unmolested in every way. All of the electronics, frets, nut, finish and both the plastic and chrome plated metal hardware are Correct and Original to the Bass. This bass was sparingly played long ago and then stored by me, until today. Globally, the bass displays some minor marks and a few small dings and dents, but there are no major cosmetic or structural issues to notate. The body and neck have some minor impressions in the finish, and there is some slight and normal finish checking present, but it's all minimal. 1967 models. 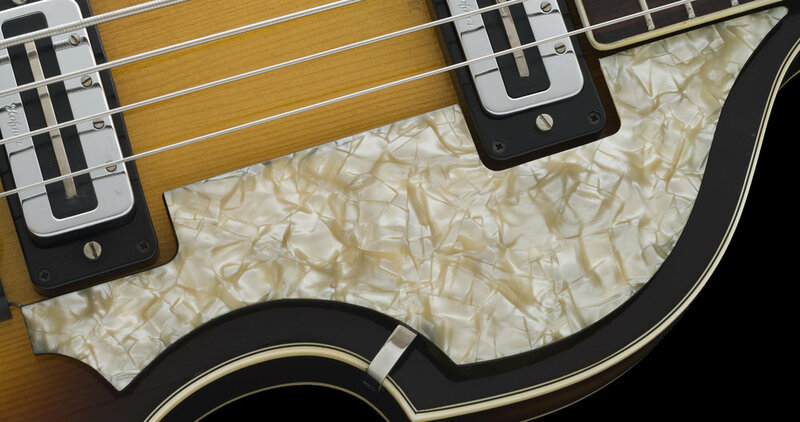 The switch to was made from the 4 individual staple/pole magnet design to a continuous bar magnet and this bass has those 2nd generation pickups. The CASE is the Hofner Deluxe Plush Chipboard and is original to the bass and is also in matching, excellent condition with a functioning handle, latches, and hinges. Remarkably, the bass also has it's Original, factory-installed Flat-Wound STRINGS that sound so good, I would never consider changing them! As a bass player and a child of the 60's, I always wanted one of these basses, who didn't? I had bought and sold quite a few of these models throughout my store career and they were all fun but for one reason or another, few of them appealed to me personally. When I encountered this particular bass, it spoke to me and I decided to hold onto this one and I must've really liked it as that was about 30 years ago! I have had played this on occasion, but it has mainly been safely stored since I acquired it. The bass is in very nice, unmolested and clean original condition. These instruments are somewhat "lightly" constructed and many do not hold up very well over time, however, this one has survived for 49 years and has a healthy neck and solid neck to body joint and is quite a bit of fun to play and or record with. Due to the strings being Vintage Flat Wounds, the tone it makes is fat and punchy and when played with a pick, it gives a fabulous percussiveness to the sound. Being hollow, these also appeal to players who may require something light on their shoulder, and due to the body design, they are best played strapped on! If you've ever wanted 1 of these, you might consider this clean and attractive low mileage survivor. The bass has been safely stored for decades and has been spared all of the "circulation" that most instruments being offered online today have undergone! Please inquire. Weight: 4 lbs. 13.2 oz.